[PDF] Handbook of Hydrogen Energy (Mechanical and Aerospace Engineering Series) | Free eBooks Download - EBOOKEE! Description: Can hydrogen and electricity supply all of the worldâ€™s energy needs? Handbook of Hydrogen Energy thoroughly explores the notion of a hydrogen economy and addresses this question. 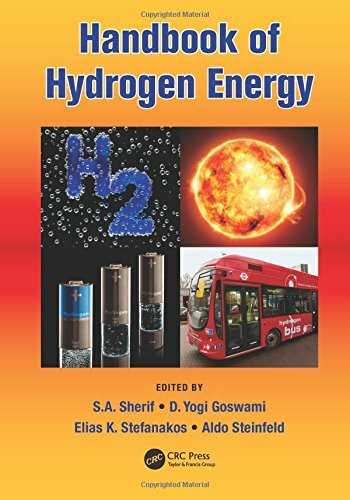 The handbook considers hydrogen and electricity as a permanent energy system and provides factual information based on science. The text focuses on a large cross section of applications such as fuel cells and catalytic combustion of hydrogen. The book also includes information on inversion curves, physical and thermodynamic tables, and properties of storage materials, data on specific heats, and compressibility and temperatureâ€“entropy charts and more. Analyzes the principles of hydrogen energy production, storage, and utilization Examines electrolysis, thermolysis, photolysis, thermochemical cycles, and production from biomass and other hydrogen production methods Covers all modes of hydrogen storage: gaseous, liquid, slush, and metal hydride storage Handbook of Hydrogen Energy serves as a resource for graduate students, as well as a reference for energy and environmental engineers and scientists. No comments for "[PDF] Handbook of Hydrogen Energy (Mechanical and Aerospace Engineering Series)".